Control, manage, access resources & Information from your home or business from anywhere with Remote Access, Remote Desktop & Virtual Private Network (VPN) applications. Let Us select the best application o software that fit your home or business need to allow you "Stay there when you can't be there". You can give rights and access in secure manner to your family or mobile employees from home, on the road / from anywhere maintaining the productivity and operations of your business. The need for secure remote access to private LAN resources, computers and servers is no longer limited to large corporations, homeowners and small business owners now have the same requirement. Remote Desktop Connection is a technology that allows you to sit at a computer (sometimes called the client computer) and connect to a remote computer (sometimes called the host computer) in a different location. For example, you can connect to your work computer from your home computer and have access to all of your programs, files, and network resources as though you were in front of your computer at work. You can leave programs running at work and then, when you get home, you can see your work computer's desktop displayed on your home computer, with the same programs running. A VPN is a secure, private communication tunnel between `two or more devices across a public network (like the Internet). These VPN devices can be either a computer running VPN software or a special device like a VPN enabled router or a more secure VPN appliance. 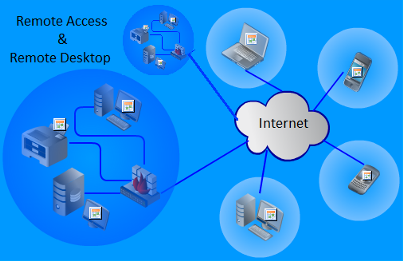 It allows your home computer/mobile device to be connected to your office network or can allow two home computers in different locations to connect to each over the Internet.